For antirust antifreeze coolant is a new generation Ethylene Glycol based premium engine coolant, offering excellent corrosion protection. Drain and Flush cooling systems : Completely drain and Flush coolant from vehicle cooling system. 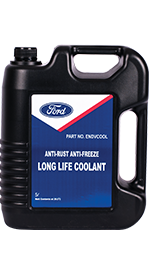 Install Ford Anti-Rust Anti-freeze Long Life coolant: Se3e Ford owner’s manual for specific directions. This coolant is in ready to use from 30 % v/v dilution with DI/DM water. Further dilution is not recommended. Why should i use a ready to use’ coolant of a concentrated version? Normal water used in field for mixing with coolant has high hardness and corrosive elements. Also wrong concentration of coolant can be used in the car. A factory prepared Ready to use coolant avoids these problems, adds strength and increase service life. It is also convenient to use. USAGE OF UAPPROVED COOLANT MAY LEAD TO PREAMTURE SYSTEM FAILURE AND A DROP IN VEHICLE PERFORMANCE. DISIPOSE OF ANTIRUST ANTI-FREEZE LONG LIFE COOLANT ACCORDING TO LOCAL LAWS AND REGUALTIONS. DO NOT SPILL ON GROUND OR INTO STORM DRAINAGE SYSTEMS. 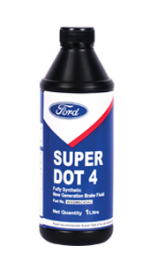 Use: Super Dot 4 Heavy Duty Brake Fluid for high quality performance. if spilt wash off with water - do not wipe. Store brake fluid only in its original container. Contamination with dirt, water, petroleum products or other materials may result in brake failure or costly repairs. Do not refill container and do not use for other liquids. Dispose of used or unused product according to relevant Indian/State laws. EYES : Flush thoroughly with water. Get medical attention immediately. SKIN : Wash throughly with soap and water. INHALATION : If affected, move to fresh air. If breathing is difficult, get medical attention immediately. INGESTION : Do not induce vomiting. Call a physician or poison control center immediately.